I always hear my friends lamenting that they can't wear Uniqlo stuff in SoCal because it's so darn hot all the time, but I think some people just don't realize there's so much more than coats and puffy jackets! Ever since I touched down back in LA a week ago, it's been nonstop meetings and business dealings. I turned to Uniqlo for all my ~bizness lady~ outfits. Together, this stretch blazer, washable silk blouse, and split-seam skirt make for fierce business attire. Separately and paired with casual pieces, they're totally wearable on the street. That's Uniqlo for you. And to my Orange County readers, rejoice! Uniqlo has just opened a new location at the prestigious South Coast Plaza in Costa Mesa, California. Now you can check out all your favorite pieces in person! Leather rolled clutch (similar here). Joe's Jeans pumps (similar here). you make this outfit look so effortless! you look stunning in this! Such a classic look. You pull off every style with such perfection! Such a classic look. You pull of every style with perfection! Love this, it's office chic but not boring. Love your style <3 And those glasses are amazing! Gorgeous! I love how sophisticated and chic you look and how you wore those clear framed glasses! Actually very much adore this outfit. Plus the frames of the glasses are sick. Awesome look, love the glasses. 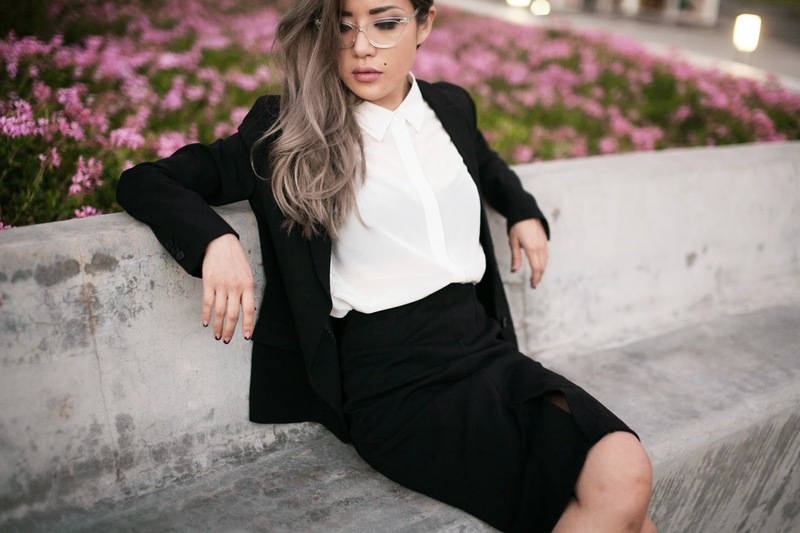 The business lady look is just good on ya! Love the frames! Who makes them?